This article explains how to properly install Product Customizer (premium tier) into a shop using the Brooklyn theme. In order to properly change the way option pricing is shown to customers, several modifications to different templates are necessary. Before you begin your installation, please ensure you've disabled the "drawer" style cart in this theme. 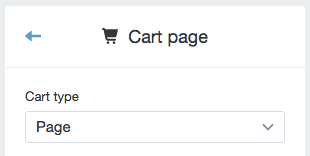 Go to "Customize theme", then under "Cart Page", change "Cart type" to "Page". The drawer cart is incompatible with option pricing.